Norman Wilkinson’s time living with his mother at Southsea looking out to the Solent was where his passion for ships and the sea, and to be an artist, was first realised. After a period spent studying at Portsmouth School of Art and under Louis Grier at St Ives, Norman Wilkinson made several voyages in coastal colliers before settling in London to work as an illustrator. 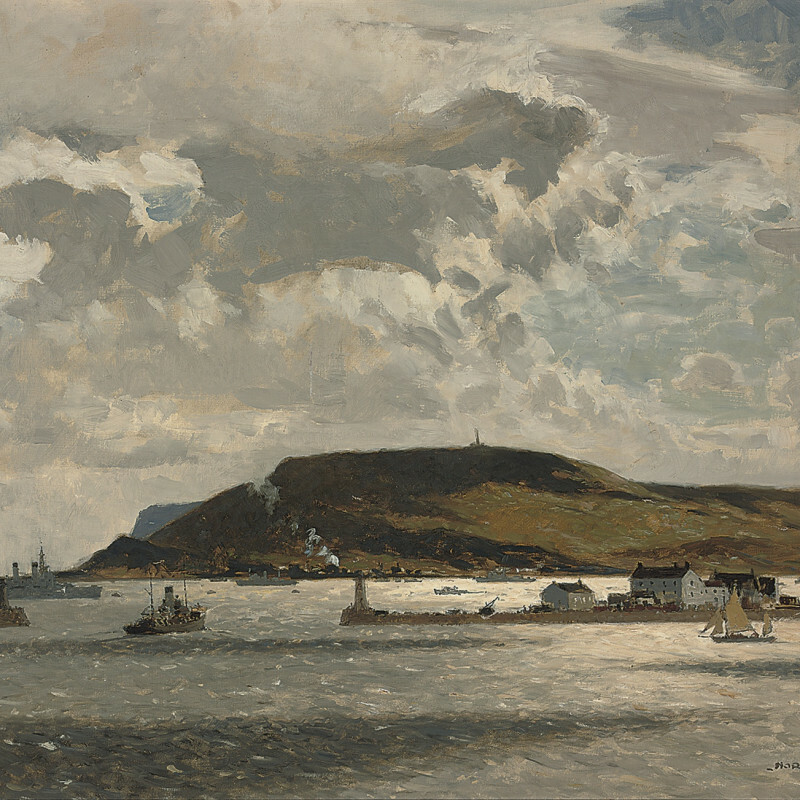 In 1915 Norman Wilkinson got a commission in the Royal Naval Reserve and it was during his time as a commander of a patrol boat that he raised the idea of dazzle-painting ships as a tactic of confusing the aim of German gunners – a practice that was largely adopted by both the naval and merchant fleets. His interest in aeroplanes led to Wilkinson being appointed inspector of camouflage with the rank of Air Commodore when the Second Wold War broke out. In addition to his war time camoufleur work, Wilkinson was also one of the best known poster designers for shipping and railway companies. Alongside his reputation as a marine artist, Wilkinson flourished in his career as a painter of river and fishing scenes – both in oils and watercolour. Painted with admirable accuracy these paintings record most of the notable pools and stretches of rivers in the UK. In 1906, Norman Wilkinson was elected to the Royal Institute of Painters in Watercolours (RI). He was made Honorable Marine Painter to the Royal Yacht Squadron in 1919. He was a member of the Royal Society of British Artists, Royal Institute of Oil Painters, Royal Society of Marine Artists, and Royal Scottish Society of Painters in Watercolours. He was appointed a Commander of the British Empire (CBE) in 1948. The Tryon Gallery exhibited his work almost every alternate year between 1961 and 1974 and he has continued to be represented in both our marine and fishing exhibitions over the years.